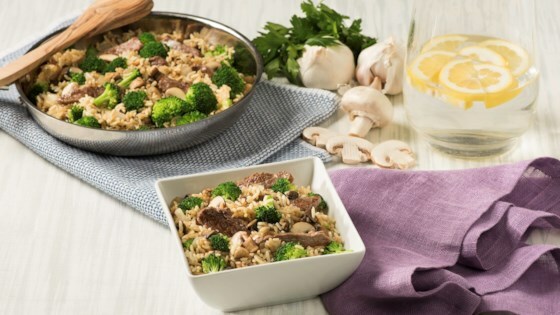 "Beef, mushrooms, broccoli-what more could you want in a delicious, family-pleasing meal? Oh, yes, it's quick and easy to make, too! The next time your family wants something beefy, turn to this recipe. You'll look like a hero." Stir in broccoli, UNCLE BEN'S(R) Flavor Infusions Garlic & Butter Rice, and water. A few suggestions would be to use a vegetable medley instead of mushrooms, long grain rice and maybe a southwestern seasoning or spice to add heat to the recipe. Followed recipe to the letter. I used thin sliced beef from Walmart. The beef was tuff but the rest of the recipe was real good. I think next time I make this I will use chicken.